Reed Rothschild invited me to be a part of the 'Sculpture Build-Off'. This creative design and sculpt project is in its third year. 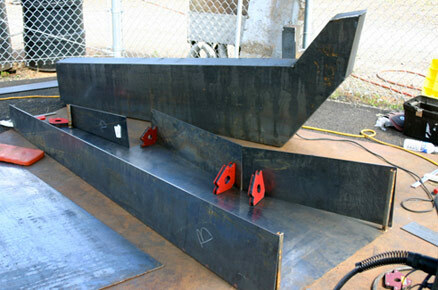 Each artist is given three days, ample materials and a space in which to design and fabricate a finished sculpture. After scaling my sketches and maquettes I took the metal to BBC Steel to be cut. ﻿With all the parts in place and the help of Lee Imonen we welded, grinded, and had a great experience among fellow sculptors. We welded, grinded, and had a great experience among fellow sculptors. With great pleasure 'Familia was born a mere three days later. 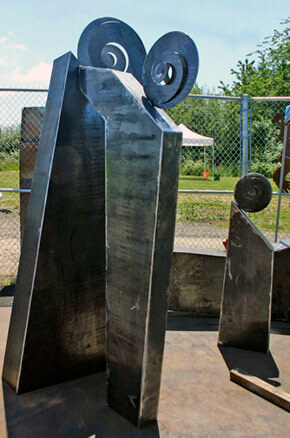 Posted on June 13, 2008 by Kim Campbell and filed under Events, Fabrication and tagged Familia metal sculpture.